To fasten correctly, always replace the cylinder head bolts. Bolts of block and head joints must be systematically replaced after each dismantling. The fastening requirements of the new concepts in engines require the cylinder head bolts to work over the “plastic zone”. The strength and traction applied on this selection, together with the thermal deflection, modify the original structure and the properties of the product. Why bolts should not be used again? While fastening by Kg., the force applied on the bolt is found within the flexible limits of the product; it means that when the applied force is taken away, the bolt goes back to its initial length. In this case, the bolts do not suffer distortions (deflections), and they could be used again. Using angular fastening, the bolt goes trough considerable strain that leads to plastic deformations (work over the “plastic zone”); meanwhile, the variable temperatures regime of modern engines expands the values of thermal elongation. Stretching within “plastic zone” is acumulative. When working on that section, bolt loses memory of its initial length when the force is withdrawn when it is dismantled. This is why the reuse becomes impossible, as the fastening capacity does not match the requirements of a proper block-head union. Proper engine repair can only be guaranteed if you’re using brand-new bolts. Would you risk the success of the repair? 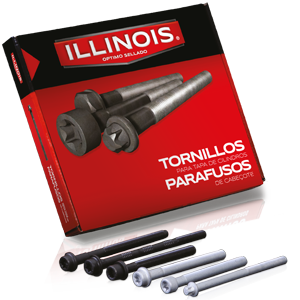 ILLINOIS strict quality controls guarantee the safety of bolts, according to the technical specifications of each type of engine.